the giant artichoke, castroville, ca | Is there any wine left? I’ll update the blog with all the pics and fun details about our Labor Day weekend trip to Carmel soon, but I had to post about our stop at the Giant Artichoke restaurant today because I can’t stop thinking about it. First of all, does anyone else wonder who the first person was that figured out artichokes are edible and how they came to that conclusion without choking on the thistles? Practically everytime Whitney and I eat artichokes we look at each other in amazement that someone found the deliciously sweet meat under all of the prickly leaves. We’ve decided we’re just too lazy to have accomplished something like that. Also, you all eat artichokes, right? I’ve talked to lots of people in Texas that have never had one because they think they’re too much work. How wrong you are! I promise soon I will post about preparing artichokes. But back to the matter at hand – fried artichoke hearts. 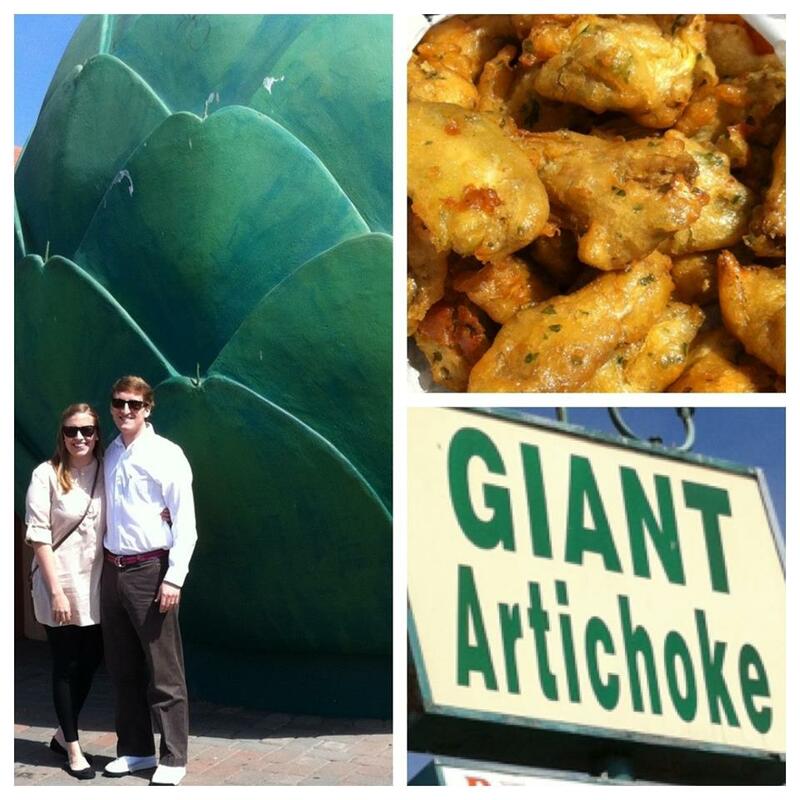 Stopping by the Giant Artichoke for fried artichoke hearts is seriously one of my favorite parts of Carmel trips. In fact, we were on 101 about 15 minutes away from the restaurant on Monday when Whitney mentioned that he hoped they weren’t closed for the holiday. I could feel tears stinging my eyes and a lump in my throat for the next 10 miles. I think Whitney regretted his words as soon as they left his mouth. Thankfully they were open and I regained my composure. Can you imagine anything better than tender, quartered artichoke hearts which have been lightly battered and fried and dusted with salt? And dipped in ranch dressing? No? My friends, that is because there is nothing better. The natural sweetness of the artichokes perfectly compliments the crunchy, salty exterior. I should probably note that I’ve never had anything else at the Giant Artichoke other than the fried artichoke hearts, so I can’t vouch for their whole menu. But get the hearts if you’re in the area. You won’t be sorry. My mouth is watering just reading about fried artichokes.